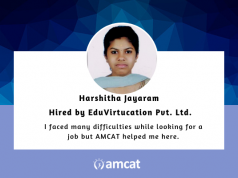 We bring you an AMCAT Testimonial which proves why you should take the AMCAT test to get placed during your campus placement. 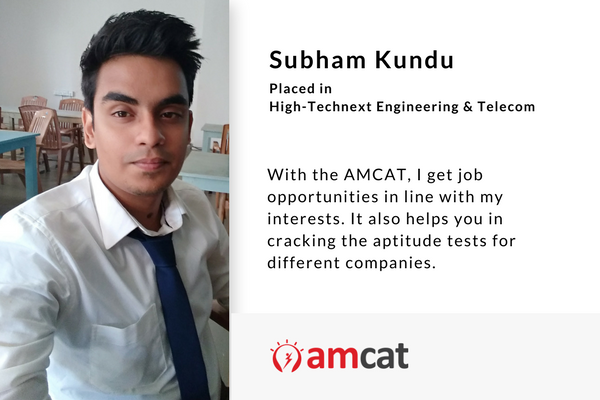 Subham Kundu reviews his AMCAT experience in this AMCAT testimonial. 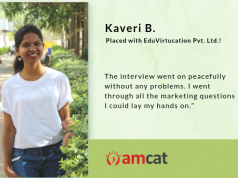 Fresh from our encounters with students who benefitted from the AMCAT as part of their campus placements, we bring you an AMCAT Testimonial which proves why you should take the test. We introduce you to Subham Kundu. Kolkata-based Subham Kundu is a 2018 graduate, nearing the end of his B.Tech in Electronics and Communication Engineering from the Neotia Institute of Technology Management and Science. And to gain a step up on his upcoming job search journey, he decided to take the AMCAT Test ahead of his campus placement stint. This is his AMCAT testimonial. On the whole, the test was a smooth run for Kundu and he claimed that he only found the core section a little bit tough. And the other reason – the one he discovered after his entire AMCAT experience? He found this after waiting for two to three months, for his first job interview call. His penultimate interview call came from the High-TechNext company and he managed to crack it. 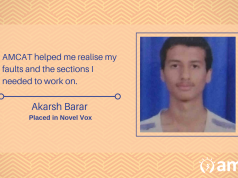 We asked him how he prepared for job interviews. Congratulations Subham – you managed to crack the campus placement interview of your choice and get placed in a job, ahead of your batch. Would you recommend the AMCAT to others? Take a chance yourself. Schedule an AMCAT Test today.